Should have made this long ago. This pie is delicious. 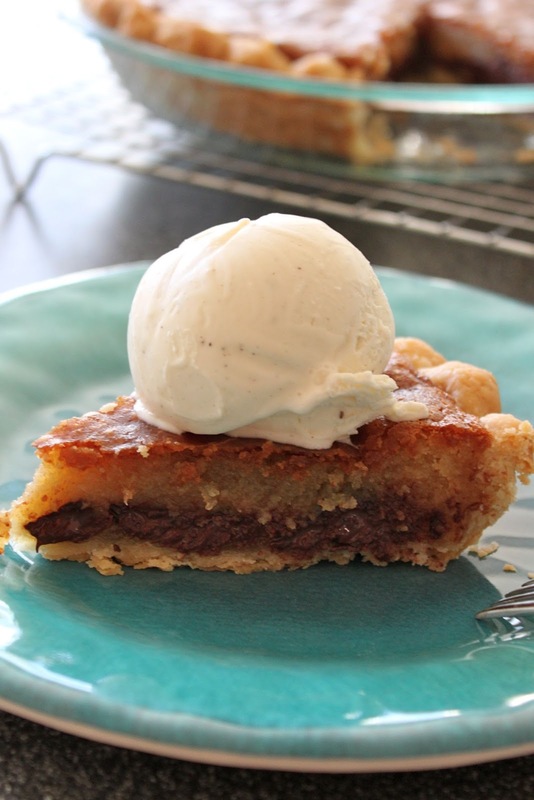 It literally is a chocolate chip cookie in a pie crust. I saw it in my Nestle Tollhouse Cookbook years ago and never really gave it much thought. I was flipping through that same cookbook several weeks ago and this recipe really jumped out. I wondered why I had never made it considering how much Zack and I both love chocolate chip cookies and pie. I was going to make it that very day...only to realize I was out of butter and sugar. Hard to believe somebody who bakes as much as I do would run out of those crucial baking building blocks, but I was indeed out. So I put this recipe on the back burner a couple more weeks. When I finally made this pie last weekend I honestly asked myself "Why didn't I made this sooner?" This pie is so tasty. If you ask me, I think it is best served warm with either a scoop of vanilla ice cream or a glass of milk. Beat eggs in a large bowl on hugh speed until foamy. Beat in flour, both sugars, and salt. Beat vanilla extract and butter. Stir in chocolate chips. Spoon in to unbaked pie shell. Bake 55 to 60 minutes or until knife inserted halfway between edge and center comes our clean. I used my homemade pie crust and I highly suggest you do as well, because store bought frozen crust is just not the same. 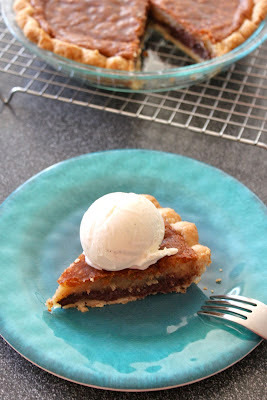 I have prepared the pie dough recipe in the food processor and by hand using a pastry cutter. It is definitely easier with the food processor, but tastes just as great doing it by hand. I did not dust the chocolate chips in flour before mixing them into the batter, hence why it looks like there is a chocolate layer in this pie. To prevent your chocolate chips from sinking, just dust them in a tablespoon of flour before mixing them in the rest of the batter.